I'd visited Kalyana and Kudala Sangama almost two decades ago but somehow my travels never went through Bagewadi. My maternal uncles has told that Basava's descendents lived there and his house still existed. Finally the day arrived. I and Pushpa drove to Bagewadi after a short visit to Muddebihal to check out its fort ruins. It was around 2 PM when we arrived at Bagewadi. First thing we found a Lingayath Khanawali and had Jolada Rotti Oota and then headed towards Basava's birthplace. I was hoping to see an ancient house but what I saw a modern structure. Government has replaced the ancient house with a modern memorial. How disappointing! Anyway.. since we are here, might as well see what's inside. 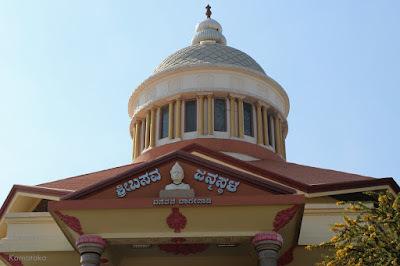 Basava Smaraka's dome towers over its locality. 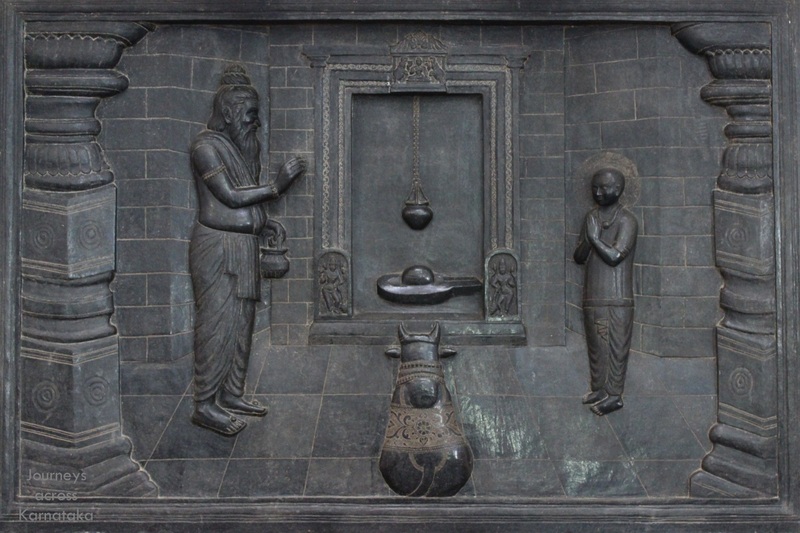 As per legends, this locality was known as Agrahara, place where Brahmin families resided. 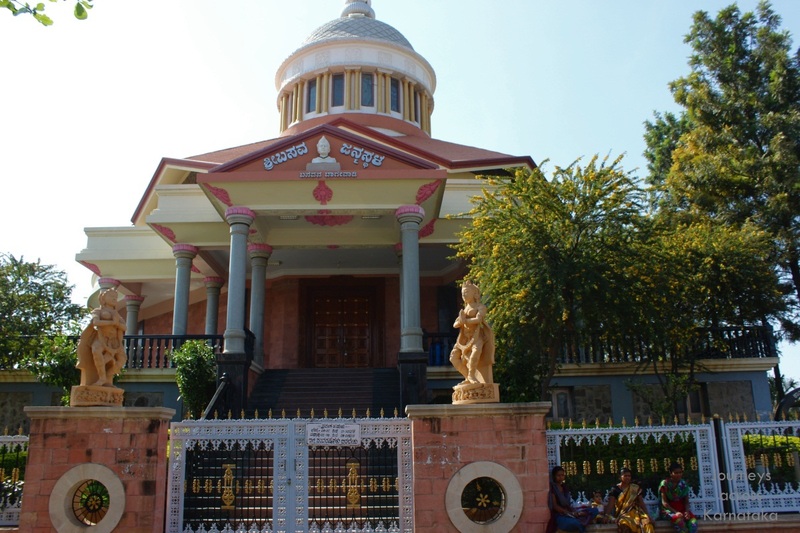 It is said that Madiraja was headman of Bagewadi then. Bagewadi was also known as Ingaleshwara Bagewadi then. The care-taker was away for lunch time. A short wait and the young care-taker arrived and open up the gates and doors. So this building was inaugurated on May 16 2010 by Chief Minister B S Yeddyurappa. I asked the care-taker if there were any photographs of the original house. Answer was no :( At least the authorities can display one photo. Inside its one single hall with a collection of statues of bronze and wall reliefs made of wood, glass and granite. 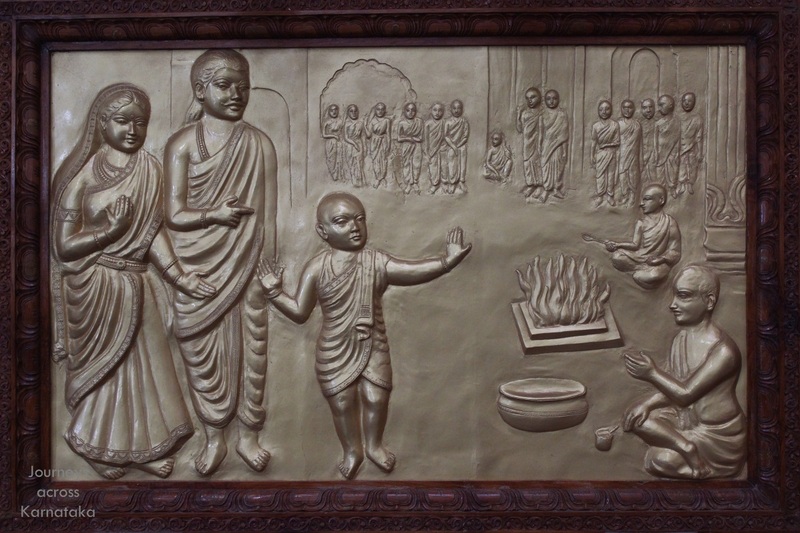 There works of art depict important moments of Basavan's life. The central item being the collection of 3 life-size statues of Guru Jatavedamuni, mother Madambike with infant Basava and father Madiraja. 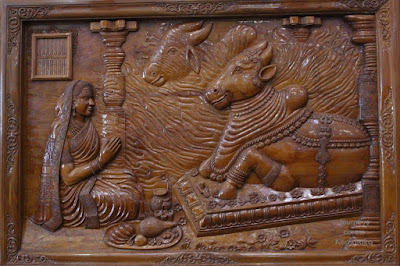 This is the happy moment after Guru Jatavedamuni awakens the infant from its sleep since the day of its birth. The parents are relieved to know their child was neither blind nor mute. 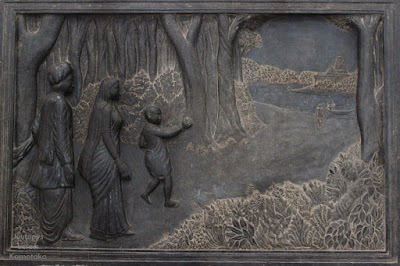 Around the hall are wall reliefs. Going in chronological order. 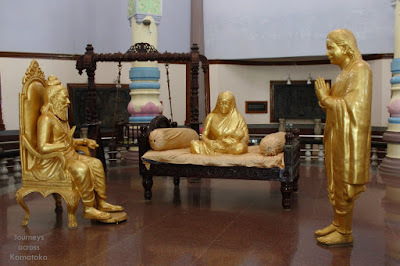 Mother Madalambika showing infant Basava in presence of his father Madiraja to their family Guru who is seen blessing the new born at their home which existed at this site. 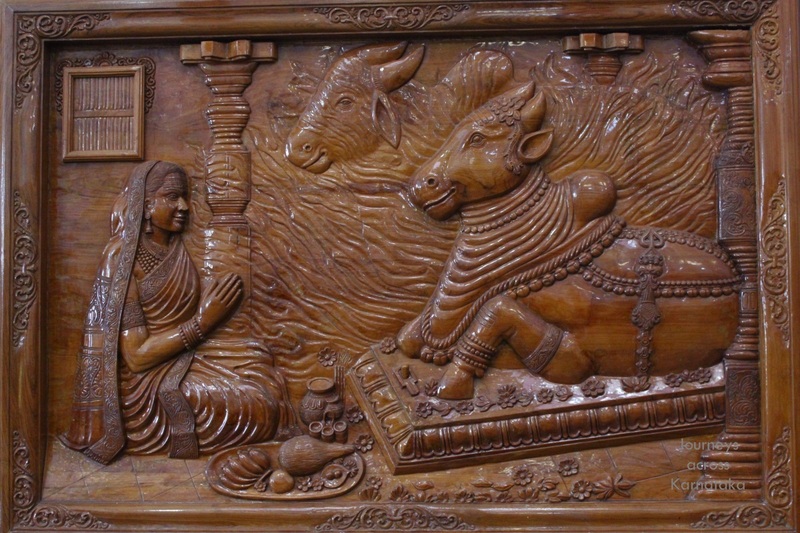 As per historic-legendary evidence Lord Basava was born on the most auspicious day of Akshaya Tritiya (the third day in the light fortnight of the Hindu month of Vaishakh). 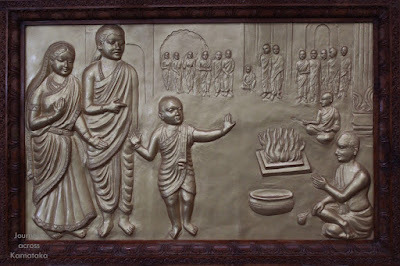 Young Basava refusing to participate in Upanayana ceremony. His thinking was different. he believed in kindness to fellow creatures rather than follow customs and traditions blindly. 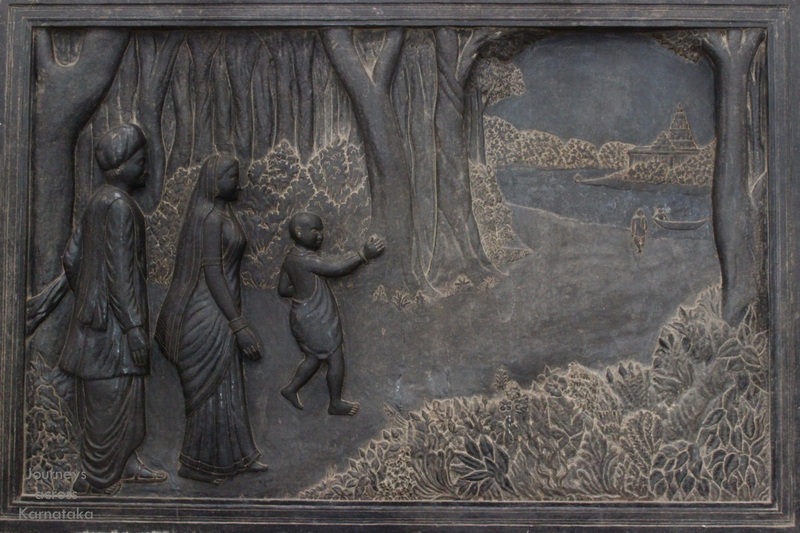 Young boy Basava rushing towards Kundala Sangama with his sister Nagamma and her husband Shivadeva. 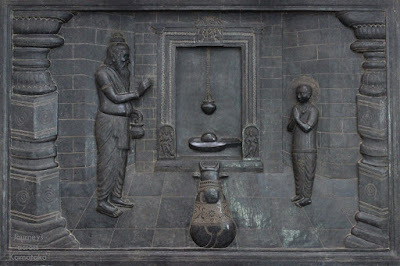 Guru Jatadevamuni initiating Basava's spiritual training at Sangameshwara Devastana. 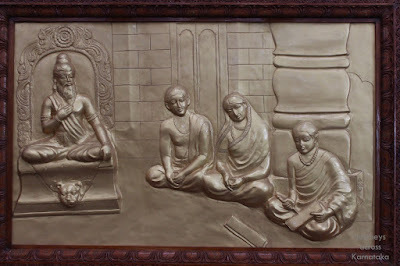 Guru Jatadevamuni imparting knowledge to Basava in Akka Nagamma and Shivadeva's presence. 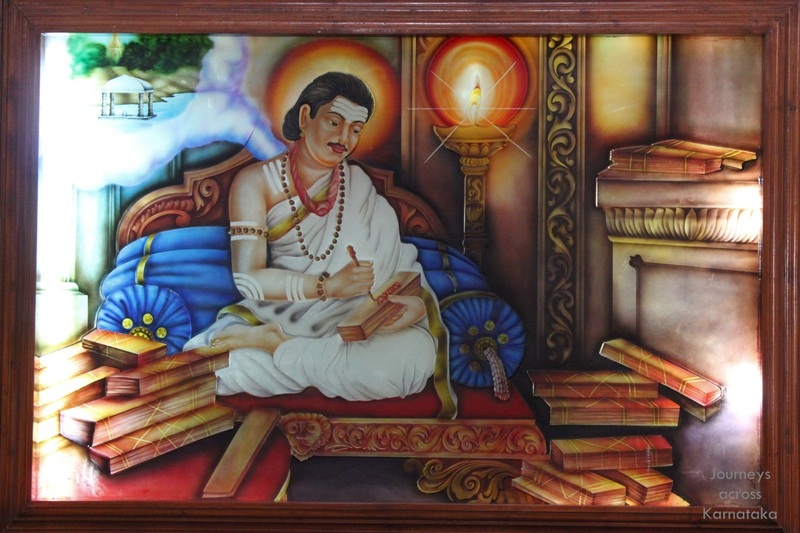 Basaveshwara composing and recording Vachanas. 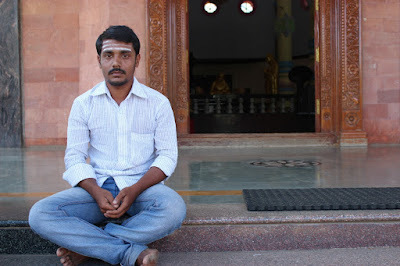 Here's the care-taker, a knowledgable young man.He could recite many Vachana's and quite formal in his speech, pure Kannada, no English words mixed.